Miroir- translating from French to English is "Mirror" if you haven't figured that out already. 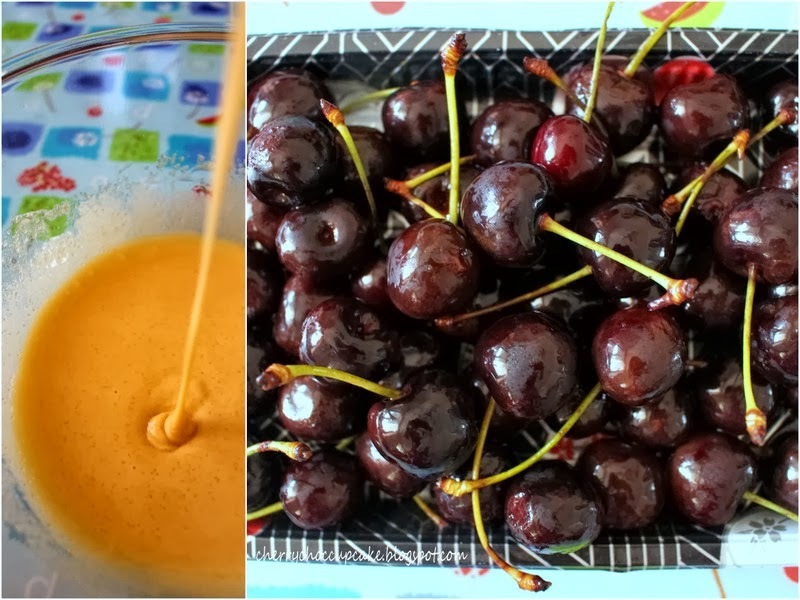 And here I am with yet another recipe featuring cherries as one of the prominent stars of the dessert. Mind you, I've been given the task of finding a dessert that would use up most of the rapidly aging cherries, which means a lot of head scratching and confused looks. Although I am aware of the classics such as Cherry Clafoutis, Cherry Blondies and so on, I felt uninspired as I craved something a little more, let's say modern and different from what I usually make. That's when I turned to my trusty cookbook, Essentials Desserts, and landed on this recipe. I've made several adaptions to this recipe: two, to be exact. Firstly, the Miroir is actually made with raspberries, but since cherries were all I had on hand, I figured that it should be a suitable substitute. Secondly, the dessert is usually made circular in a cake pan, but since my square cake pan was desperate for use, I technically turned this into a slice rather than a cake, if you know what I mean. I also found that the sponge base was very thin and delicate, so I doubled the ingredients from the book in the recipe below. And after a whole day of pitting and pureeing cherries, which in turn sprayed cherry juice everywhere, including on my poor cat, the Miroir was finally complete in one piece. Not only have I spent copious amounts of time perfecting each layer, consisting of the sponge cake base, cherry mousse and cherry jelly topping, but the time it takes for each layer to set and the whole thing to set overnight in the fridge makes it seem like a massive task for the average baker. But hard work does eventually pay off, right? It certainly did for me as I tried a slice, feeling its light texture like a cloud disintegrate in my mouth. Its silkiness brought about a refreshing quality to the slice, especially since the jelly topping is essentially cherry puree. Overall, its a nice summer dessert that features a modern twist on a classic. 1. Preheat the oven to 180 degrees C. Lightly grease an 8 inch square cake pan (removable base) and line base with baking paper. 2. For the sponge base, whisk eggs and sugar with an electric mixer for 5 minutes, until thick and fluffy. Sift the flours together, and then fold into the egg mixture with a rubber spatula. Spread evenly into the prepared tin using a small palette knife and bake for 10-15 minutes until lightly browned and shrunk slightly away from the edge of the pan. Remove from the tin and cool completely on a wire rack. 4. Sprinkle the gelatin in an even layer over 1/4 cup of water in a small heatproof bowl and leave to go spongy. Put a large saucepan with about 4 cm water on to boil. Carefully lower the gelatin bowl into the water and stir until dissolved. Stir the slightly cooled gelatin and cherry puree into the custard mixture, then refrigerate for 30 minutes until thick not set, stirring occasionally. Whisk the cream until soft peaks form and fold into the cherry mixture until incorporated. Place the sponge in the base of the prepared pan and pour the cherry mixture evenly over the top. Refrigerate for 4 hours, or until firm. 5. For the cherry topping, sprinkle the gelatin in an even layer over 1/3 cup water in a heatproof bowl and leave to go spongy. Put a large pan filled with 4 cm water on to boil. Carefully lower the gelatin bowl into the water and stir until dissolved. After slightly cooled, stir in reserved cherry puree and pour evenly over the set mousse, then refrigerate for 30 minutes until set. Slice into small pieces with a knife dipped in hot water. Top with fresh cherries, dust with a little icing sugar if desired and serve with cream.